The Gironès area offers a wonderful combination of scenic, historical, cultural and gastronomic attractions. This is a place to explore in depth and we’d like to offer you a taste of what you’ll find. Some of the most noteworthy features of the landscape are the volcanic area of the Llémena valley and Adri, the plains of Llagostera, the areas surrounding Ter and Onyar rivers, and the Gavarres massif. Mountain biking, kayaking and hiking are just some of the great ways to enjoy this scenery, as you pass through charming towns and villages such as Madremanya, Sant Martí Vell and many others. 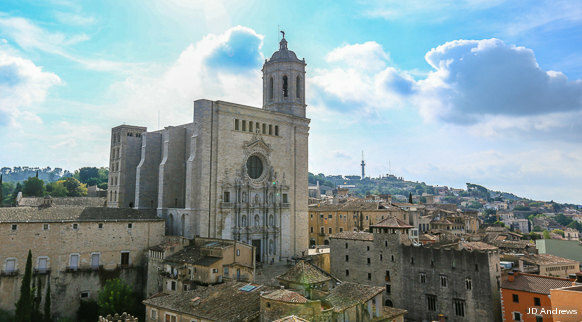 As for history, you can travel back to the time of the Iberians, the original settlers of the present-day city of Girona. The Greeks and Romans also left their mark but the Middle Ages is the historical period with the most prominent presence. Take the old quarter, for example, with the wonderful call jueu (Jewish quarter), a must-see attraction. The county is also crammed with culture, as testified by the fairs, markets, festivals and traditions of each town. And when it comes to gastronomy, there are great cheeses, delicious cured sausages and plenty of mouth-watering options for enjoying a cuisine that combines large helpings of tradition and creativity.